One of the Seven Natural Wonders of the World and a UNESCO World Heritage Site, Victoria Falls is one of Africa’s greatest geographical features. At 1700 metres wide and over 100 metres in height, it is the largest single waterfall in the world. This exciting helicopter journey offers an opportunity to discover a different perspective of this natural wonder. The helicopters are specifically designed with ‘bubble shaped’ windows perfect for panoramic viewing and great photographic opportunities from all seats. Choose from either a 12-13 minute ‘Flight of Angels’ or the 25 minute ‘Zambezi Spectacular’. On the Flight of Angels, the pilot will fly left and right hand circuits over the falls in both directions to give you the best views. A trip up the Zambezi River and back over the Zambezi National Park completes your flight. 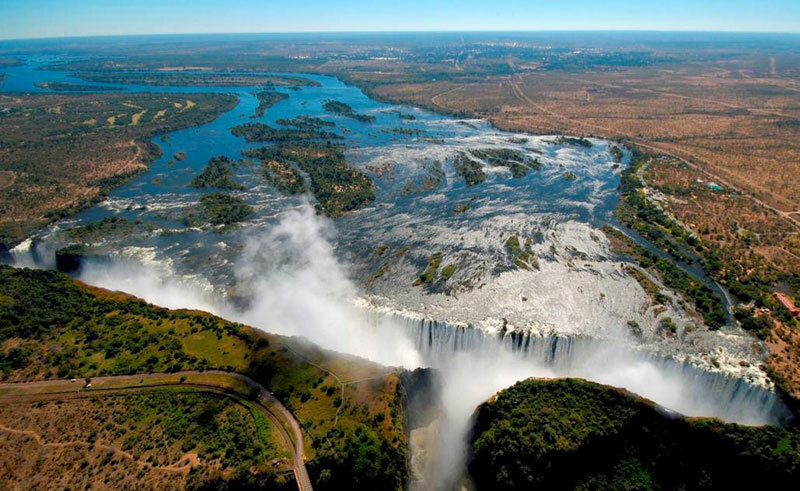 The Zambezi Spectacular also features the dramatic Bakota Gorge. Please note – Government fees of USD15 per person are payable locally in cash in Zimbabwe. This amount is subject to change without prior warning. If you do the helicopter flight from the Zambian side, a safety and navigation fee of USD6 per person is required and will be paid directly at the helipad. Price: 12/13 minute flight: £97, 25 minute flight £183. Minimum 3 passengers. Experience the raw power of Victoria Falls, one of the world's Seven Natural Wonders on this short itinerary staying at lodge near to the legendary falls. Discover all of Botswana’s northern highlights on this nine-day holiday including Chobe National Park and the Okavango Delta, as well as the majestic Victoria Falls from Zimbabwe. A land of contrasts: this itinerary showcases Zimbabwe’s best known attraction with its largest national park. Discover Zimbabwe on this fly-in safari beginning at Victoria Falls and finishing at Mana Pools National Park.